"Three Naughty Doggies"/"That's Not Bats!" The neighbourhood kittens are pestering Streaky for a story and the cheeky furball divulges an adventure that begins way back on Krypton. The high council express concern that since Jor-El exiled Zod, Ursa and Non that they had been left with a terrible problem to deal with. Namely Tronk, Vilea and Dom, Zod's trio of pet hounds. Jor-El places all three vicious dogs into a rocket destined for Sirius, the Dog Star, however, during the journey through space the dogs damage the guidance systems and are knocked off course to Earth. They awaken to discover they are superpowerful and the world, their oyster. Streaky discovers them and valiantly tries to stop their attack on Earth but he is out numbered and seeks his two friends Kevin and Krypto. Vacationing in Tahiti, Krypto and his owner are surprised to see Streaky arrive with the villains in tow. A battle ensues with both sides locked in equal combat, neither able to get the upper hand. Dom then grabs Kevin and threatens to kill his hostage if Krypto doesn't surrender and give up his powers. 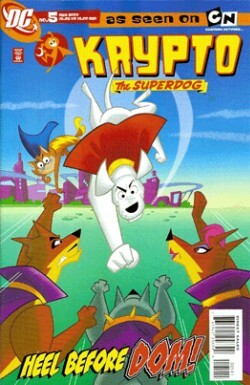 Krypto races away to grab a large lead chest filled with 'ceremonial items,' but just as Dom and his minions are getting cocky Krypto reveals the 'crown jewel' to be a chunk of Kryptonite. It quickly incapacitates the villains and Krypto and Streaky wrap them up and trap them back into the rocket they arrived in. With the help of a holo recording of Jor-El they repair the rocket and send it to its original destination in the Sirius System. Krypto is visiting Ace in Gotham when they are quickly roped into helping Batman with a mystery. Commissioner Gordon is attacked by a swarm of bats and then Gotham is systematically robbed by more of the critters! Ace and Krypto follow the signals being emitted that are controlling the bats to a field and machines manned by he Joker's pet hyenas. Fleeing as soon as they notice the cowl the Hyenas don't stick around long enough to realise it isn't really Bruce. Krypto and Ace follow the bats into an old house and though they suddenly lose track they interrogate a frightened light furred bat about the thieves. The bat reveals that the robberies are being made by weird 'out of towners' native to a field nearby. Searching carefully the dynamic duo stake out the hidden loot, waiting for the criminals to collect it again. Naturally the Hyenas return and are again tricked into seeing 'The Batman.' This time however they are caught and predictably contact their mastermind via a hidden comlink. The Hyenas, thinking they'd been distracting Batman realise it was a trick to send a signal revealing Joker's location. The Bats turned out to be robotic and camouflaged in the field all along! Joker meanwhile is apprehended in the middle of a crime and shocked Batman was able to foil him! Story - 5: Homage to Superman: The Movie & Superman II! I think it is a great way to introduce a new trio of Supervillians and make it fun! Can't tell you how much fun this was to read! The Ace backup was iffy but it linked the animated universe together which works for me! Art - 5: As crisp as the animated show itself!! Cover Art - 5: Just being a great homage isn't enough, to make it unique at the same time takes a lot of work and it's been done superbly here!